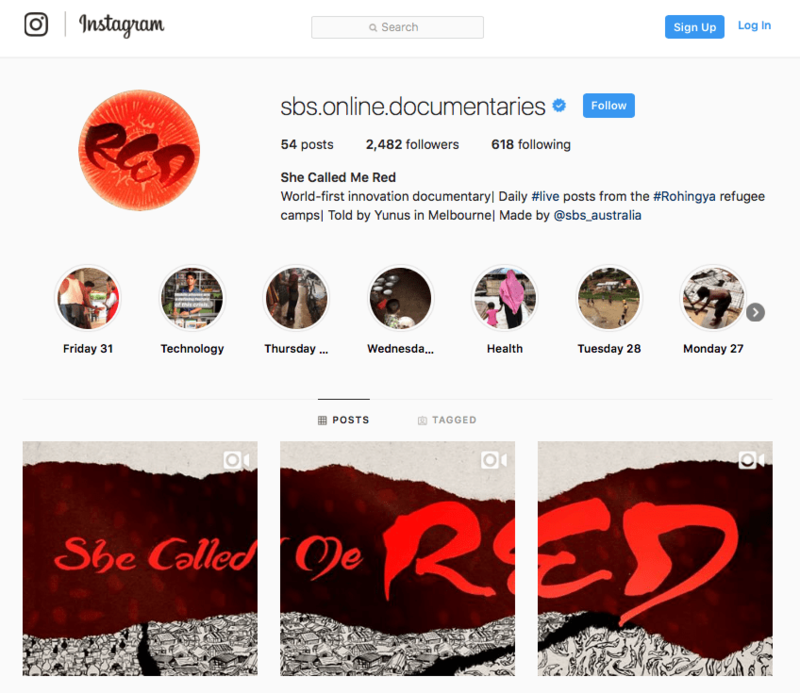 That’s the first post in the SBS online documentary, She Called Me Red, about Yunus in Melbourne and his family in the refugee mega-camp near the border of Bangladesh and Myanmar. I’ve spent a lot of time with Yunus in the last few months. The first part of the documentary is out now, delivered via a series of posts—photos, artwork, text and videos—on Instagram. The UN describes the violence against the Rohingya beginning in late August 2017 as genocide. This documentary reveals a small part of how it affected one family. You can view ‘She Called Me Red’ retrospectively in grid-view, starting from the bottom right corner of the account, and through the daily Instagram stories pinned at the top of the project. Who owns a story? Is it something a journalist takes from an interviewee or is it a collaboration? Non-fiction writers are suckers for this quote. The afflicted and conflicted among us whisper it like confession; may it absolve our anguish. But the ruthless and thoughtless surely cherish it more, because it offers a tacit blessing: if it’s the craft that’s flawed, what else to do? In recent years, I’ve been writing about Australia’s offshore immigration detention system. 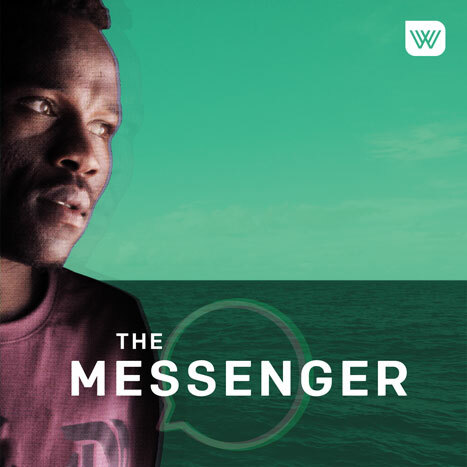 I spent countless hours exchanging voice messages with Abdul Aziz Muhamat, a Sudanese refugee on Manus Island, for The Messenger podcast, and I covered the closure of the detention centre for Harper’s Magazine. The men I’ve reported on remain there. I know I asked a lot of Aziz, and many others, in the course of my work. So where does my journalism sit in Malcolm’s summation? If I don’t accept it’s immoral, am I thick? Or just not ruthless enough? After all, the practice of journalism is book-ended by two distinct approaches: at one end, I, the journalist own the story; at the other, the subject owns the story — it’s a collaborative effort. Usually, but not always, investigative journalism takes the former approach. Davis, for instance, has a particular interest in the criminal justice system, and that means reporting on vulnerable people. “The stories are really important to me — there are too many people in jail, too many people with addictions that aren’t being dealt with properly, too many women in abusive relationships. The challenge is finding a way to tell those stories and still sleep at night,” she says. In 2012, she contacted the NSW Drug Court about documenting the way it works. Through the court, long-term addicts are released from jail so long as they join a strict rehabilitation program designed to end their addiction. It took 12 months to convince the court to give her access. Then, for two years, she followed the progress of seven people through the program. “It was a mammoth undertaking — a labour of love,” Davis says. She produced a three-part series for ABC Radio National, which first aired in 2015. It was a risky proposition for everyone, including Davis. She was working with very vulnerable people who had long histories of drug addiction, sexual abuse — especially the women — and serious physical and mental health problems. They could be sent back to prison at any time. When she began, Davis told the participants very clearly what she wanted to do, and didn’t tape the first two interviews. She advised them to seek independent legal advice, and developed a consent form that acknowledged they’d done so. Their real names wouldn’t be used and they could stop at any time. One quandary was whether, or how, she would intervene if she found out a participant was in danger. “Sometimes they would tell me things that made me very scared for them, particularly the women, about their housing or their domestic situation,” she says. She resolved to tell the court welfare officers to speak to the person — without spilling the details herself — and also told the person directly what she was doing. It was a hard line to walk. 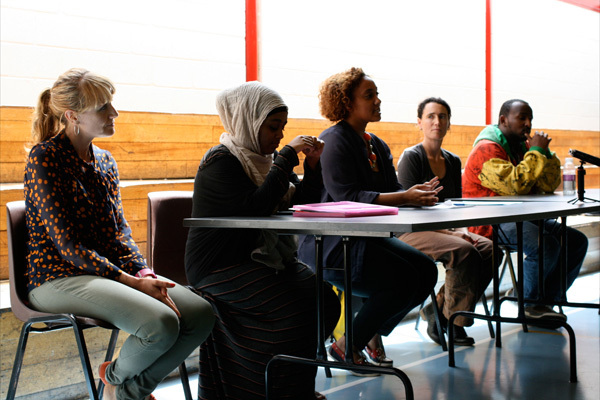 The participants’ rapport with Davis was evident — the women called her “Shaz”. All were startlingly frank about their struggles and failings. Throughout the two years, as Davis conducted interviews once a week, she would often have to remind them that she was a journalist, that she was recording, and what they said could be used in the documentary. Davis does not consider the work collaborative. She didn’t show or play the material to her interviewees before it was broadcast, but she sought to represent them fairly and with complexity. One of the men was occasionally verbally aggressive with her, but she chose not to use that tape, because that side of his character was evident in the way he spoke about the judge. She also left out some compelling information about one of the women, for fear it could put her at risk of violence. She called the woman to ask whether to include it. “The code is a very useful starting point, but the whole question of consent isn’t even mentioned,” says Denis Muller, who teaches media ethics at the University of Melbourne. A major review published in 1997 proposed an expanded version, including the direction that journalists should “interview only with informed consent”, as well as a guidance clause noting that values conflict and that “ethics requires conscientious decision-making in context”. But it wasn’t adopted. But in stories where you develop a relationship with someone over time, Muller warns of another ethical concern — the risk of capture. It’s his practice to speak openly with people about the content of his stories, show them the material, and seek clarification. Teece-Johnson believes it’s possible to use this collaborative approach even when a story is unflattering, or involves conflict, or when someone isn’t being honest. Although he’s conscious of the power dynamics dissected by Janet Malcolm, Teece-Johnson says he’s guided by a belief that journalism should empower people and communities to make change. He counters with a different quote, from Ethel L Payne, an African-American journalist celebrated for her coverage of the civil rights movement: “the black press is an advocacy press”. 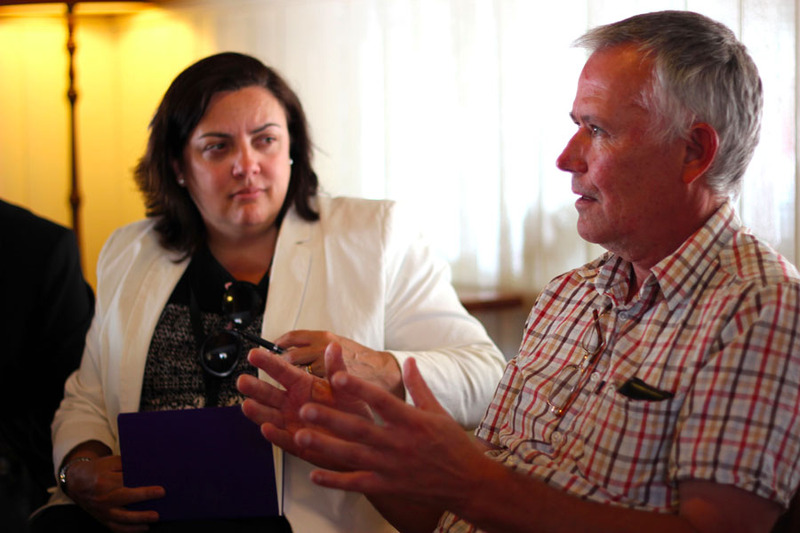 Although his approach is shaped by his conception of Aboriginal journalism, he argues all journalists can work collaboratively with their interviewees, where the stories permit. It’s a way to avoid the long history of appropriation and misappropriation, especially when journalists are outsiders to the communities they’re writing about. Collaboration does not necessarily mean the resulting stories are “softer”. Take Anjali Nayar, a Canadian journalist who has reported extensively from Kenya and elsewhere in Africa. For her, collaboration not only affects how people are represented, or even which side of the story is told, but whether an important story gets told at all. In the early scenes of her new documentary Silas, about illegal logging and corruption in Liberia, Silas Siakor is sitting in the back of a car that passes a truck hauling logs. There should be no forestry in that region, so he leans out the window to take a photo. The app, Timby, is a closed system, enabling people to upload, gather and share evidence such as geolocated photos, videos and notes with a group of trusted people over time. Nayar calls it community journalism, because it facilitates investigations of long-term issues (in contrast to citizen journalism, which operates for flash crises or incidents). In Silas, the evidence people collected using Timby changed the story. It went from the smaller issue she’d set out to cover, about logging companies and communities, to an exposé of corruption that implicated the country’s Nobel Prize-winning president, Ellen Johnson Sirleaf. Like the other journalists I spoke to, I take this not to mean that betrayal is inevitable, or that collaboration implies compromise, but that chroniclers should sit uncomfortably at our keyboards, our power vexing us like a stiff neck. Malcolm’s ending seems like the right place for the discussion to begin. This story was published in The Walkley Magazine, July 2018, and online at Medium with great illustrations by Tom Jellett. LIGHTENING flashed behind the fiberglass banana boat, but ahead of us the night sky was clear and the water was calm. 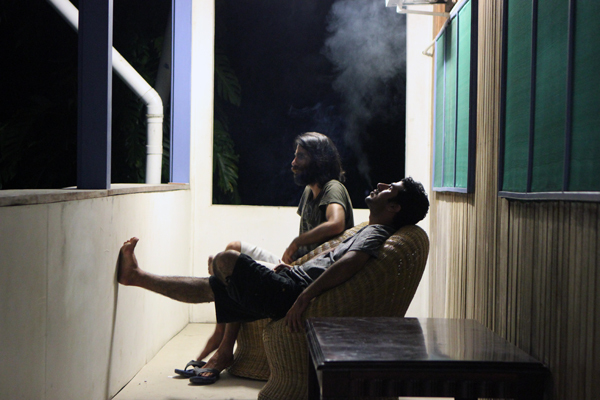 Ezatullah Kakar, a Pakistani refugee, and I were in the South Pacific Ocean, 2 degrees shy of the equator, just off the coast of Papua New Guinea’s Manus Island. As we cut smoothly through the flat sea, one of the men aboard passed the skipper a beer. The mood was tense and quiet, the three-man crew speaking only when necessary. Kakar didn’t share their apprehension. He took out his phone, ran one hand through his wavy hair, threw his arm around me, and snapped a moonlit selfie of the two of us. I must have looked nervous, because Kakar smiled encouragingly at me. “I believe if we are doing good things, no one will catch us,” he said. Some Pacific Island communities are already moving themselves beyond rising tides, but there’s nothing simple about how, why or when they’re doing it. FOR the last ten years, Ursula Rakova has been trying to move her small community to higher ground. The atoll is in the South Pacific, three hours by boat “on a really calm day” from Buka, the northernmost island of Bougainville. Progress, however, has been slow. Rakova says the Carteret Island population numbers 2700. The Catholic Church donated four parcels of land in Bougainville. So far, only ten families, just over 100 people, have moved to one of those plots, at Tinputz. The Carteret Islanders’ new settlement at Tinputz is just one example among many Pacific Island communities in flux – from tiny villages though to whole cities, from mere metres to thousands of nautical miles, on someone else’s land or their own. In the media, Pacific islands are rapidly populating with apocryphal climate change “firsts”: the first islands to disappear, the first “climate refugees”, the first village to relocate, the first city to move, the first nation to disappear. But as Rakova knows too well, what’s happening isn’t straightforward. It’s a complex phenomenon, one that encompasses lived-experience and science, perception and propaganda, concepts of justice and questions of land. So why are people planning to relocate in the Pacific? Is it something new? Who’s talking about it, and what are they saying? In 2012, Dr Simon Albert was out on a boat with an old man from the Solomon Islands. “He pointed at a reef, and said: ‘There used to be islands there – I was camping and fishing here with my son ten years ago,’” Albert says. The researcher, from University of Queensland’s school of civil engineering, was surprised. It prompted him to search for old photos. “Sure enough, ten years ago, it was a significant, five-hectare island,” he says. The results were published in May this year, and induced an unexpected frenzy among media eager to report on frontline evidence of climate change. The results were more nuanced, however: Albert and his team attributed the sea-level rise to both climate change and climatic cycles. “The Solomons, over the last 20 years, has been this perfect storm of high rates of sea-level rise, more trade winds and high wave energy,” he explains. But that doesn’t diminish the meaning of the findings: the conditions in the Solomons provide “insight into the future impacts of accelerated sea-level rise”. The threat of climate change was just one of the drivers for the relocation plan, alongside pressing concerns of population growth, coastal erosion and tsunami risks. But the prospect of increasing rates of sea-level rise did change the equation. “It no longer made sense to invest in infrastructure on a place that has a very defined life,” he says. The case of Taro offers a good case study for the environmental issues elsewhere in the western tropical Pacific, Albert explains. Erosion and flooding threaten villages and infrastructure in many places, but these problems are largely caused by extreme weather, seawalls or inappropriate planning and development – not just sea-level rise propelled by climate change. Connell has been writing about the Carteret Islands since the 1980s. Despite noting that scientific studies have been absent there, Connell surmised that the primary cause of the islands’ problems is “human influence” – clearing mangroves, dynamiting reefs and building sea walls – along with cyclical weather extremes, such as king tides. Sustenance, too, has been a long-term problem. From the 1960s, he said, patrol reports by the Australian colonial administration “commented on food and timber shortages, and occasionally made reference to malnutrition”. 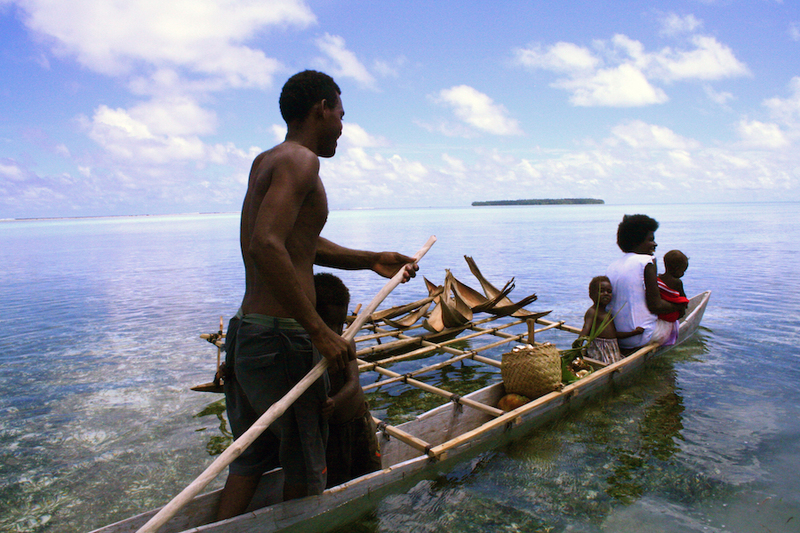 Climate change is present in the Pacific – as everywhere – but its effects on people and settlements are hard to delineate. A 2014 report by Australia’s CSIRO and Bureau of Meteorology described a trend of more warmer days and nights in the Western Tropical Pacific, but variable rainfall, variable rates of sea-level rise, and no clear signal in the number of intense cyclones. Its long-term projections include a doubling or quadrupling in the frequency of extreme rainfall by 2090, as well as rising seas and fewer, but more severe, tropical cyclones. In early 2015, Jillian Campbell travelled with local researchers around Nauru, Kiribati and Tuvalu, asking nearly 6000 people about their basic needs, environmental problems and migration patterns. It was a project of the United Nations Economic and Social Commission for Asia and the Pacific. The researchers told participants it was about climate change, but from then on, they didn’t mention the hot-button words. “We didn’t want to bias the survey, because climate change is becoming such a catchphrase,” Campbell says. Instead, they asked questions about people’s observations of flooding or food availability. In her findings, however, Campbell connected their answers to the impacts climate change. Most people in each country have experienced climate change impacts, she says. They reported things like increased flooding, saltwater intrusion and drought. In Tuvalu and Kiribati, seven out of ten people said they might need to leave if those problems grew more acute. When that kind of need arises, the precise degree to which climate change is culpable is unimportant. But there are reasons why the causes and semantics do matter: the adaptation decisions villagers and governments make, and their ability to marshal funding, is influenced by the framing of their problems. Should people move, or are there other solutions? Who decides? Who owns the land? Who should go? Where to? Christine Fung has been wrestling with these questions – and many more – for the last three years, working on the Fijian government’s forthcoming relocation guidelines. “As the consultations went along, it became very apparent that it is quite a complex issue,” she says. Fung is the technical advisor on a programme called ‘Coping with Climate Change in the Pacific Island Region’, coordinated by development agencies GIZ and Pacific Community. 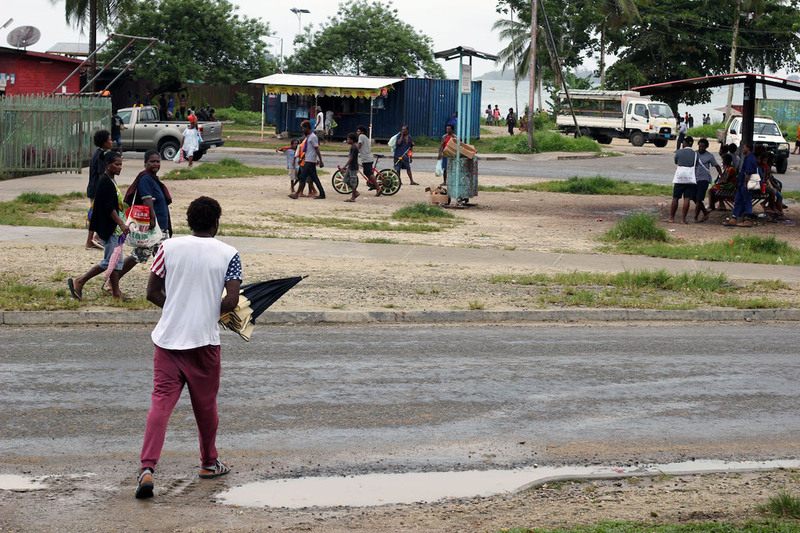 In Fiji, over 60 villages have already been identified for relocation and the issue often makes the front page of the Fiji Times. As the government prepares its guidelines, Fung has been collating the lessons from previous relocations, such as the stalled attempt to move the village of Narikoso, on Ono Island. Subsequently, technical assessments have indicated that only the first row of houses is now at risk. The erosion had been worsened by a seawall built in the 1960s. “Unfortunately, in the process of clearing the new site they also removed mangroves and coastal vegetation – the very environment that was protecting the village,” she says. So far, no one has moved, but a partial relocation will begin soon. Vunidogoloa, on the island of Vanua Levu, is another of “the firsts”: it’s often described as the first community to permanently relocate due to climate change. In 2014, the village retreated about 20 minutes walk from the coastline, but still within its clan land. Dr Celia McMichael, an anthropologist at the University of Melbourne, travelled to Fiji in late 2015 and again in June 2016, visiting several communities. She says relocation is being driven “in villages where there is a charismatic leader who is clear that they’re affected by climate change”. That’s the case in Vunidogoloa, where headman Sailosi Ramatu has appeared in many media interviews. McMichael’s ongoing research is about what happens next: “When it comes to the crunch, what is the experience of moving? How does it affect their lives and livelihoods, and the future for their families and communities?” In Vunidogoloa, people told her they’re happy with their new site. The old village was flooding often, and the new one is much more accessible – it’s right on a bus route to the market. The change has influenced village life: dwellings are smaller, so people now live as nuclear families. For the time being there’s no church and some people worry that the devoutly Methodist congregation is splintering. And because it’s hilly, some elderly people feel less mobile and more isolated. In Vunidogoloa and some other Fijian villages, she says, people are telling a story of mobility and agency at the same time as a story of being struck by climate change. The relocations offer a contrast to the spectacle presented in international media, where people are often reduced to “climate refugees” in waiting. In Fiji so far, planned village relocations generally involve relatively small retreats within clan land. When people plan to move onto someone else’s territory, the task becomes even more complex. Professor Jane McAdam, from the law faculty of the University of New South Wales, says there’s a set of “very, very tricky questions to be balanced”. In a paper published in 2015, together with Elizabeth Ferris from Brookings Institution, she raises issues ranging from access to land and the maintenance of cultural identities, to decision-making authority, consent and compensation, and, subsequently, the difficult prospect of guaranteeing livelihoods, infrastructure and public services. 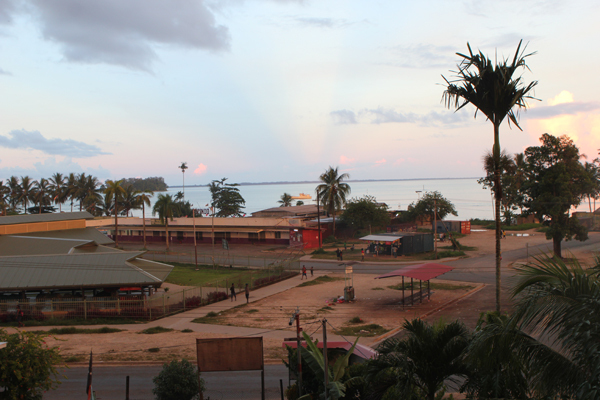 In mid-2014, Kiribati received global press for its decision to purchase 20 square kilometres of land on Vanua Levu, Fiji. Then-president Anote Tong was quoted stating it might be used for relocation as a last resort. Subsequently, he said the purpose was to guarantee food security. Tong was also renowned for championing the concept of “migration with dignity”. But the government’s stance is more a vision statement than a policy: an aspiration to create opportunities for I-Kiribati to migrate and to lift education levels so they’re more attractive as migrants. For now, however, migration options remain limited. The population is over 100,000. Every year, 75 families are eligible to migrate to New Zealand. To work in Australia, I-Kiribati can apply for (difficult to get) skilled worker visas, seasonal worker visas, or one of only 250 places under the new two-year “micro-state visa”, divided between Kiribati and the much smaller nations of Nauru and Tuvalu. McAdam says cross-border migration at present remains a matter for individuals, rather than entire communities. But with more planned relocations on the horizon, she says we can still learn from two historical cases in the Pacific, and the legacies borne by subsequent generations. In December 1945, the British Phosphate Commission expanded its mining operations on the island of Banaba, at the expense of the locals: they were moved to Rabi Island, in Fiji. Then, in 1947, just two years later, people from another Pacific Island, Vaitupu, settled on Kioa, an island close by. Whereas the Banabans (who were from present-day Kiribati) were forced to leave, the Vaitupuans (part of present-day Tuvalu) initiated the move themselves as a long-term precaution against overcrowding. 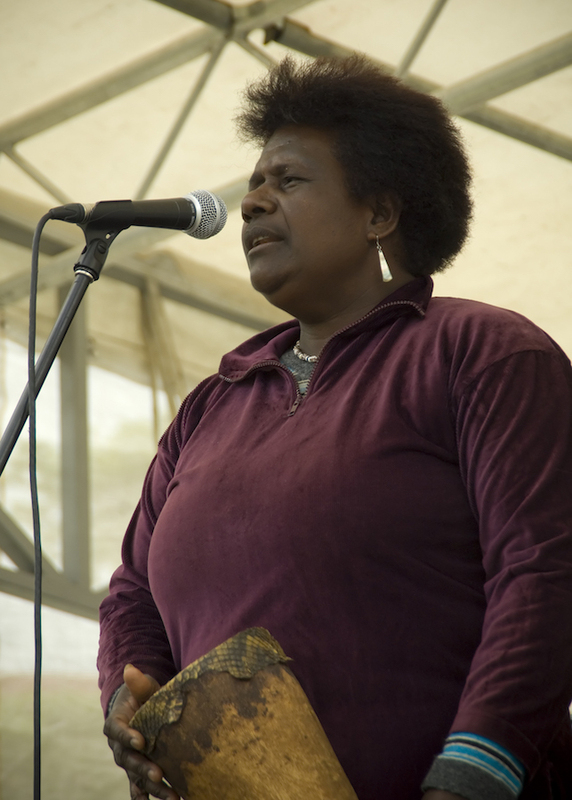 Ursula Rakova lives at the Carteret Islanders’ new settlement at Tinputz, on Bougainville. At night she tries to catch up on emails, because in the daytime, she’s usually caught up doing the work of connecting with “the host community” – contributing to local fundraising and various celebrations. The challenges are deep: the land Tulele Peisa was given by the Catholic Church is in four locations, one on a different island. The Carteret Islanders’ language is Halia, which isn’t one of the 43 languages spoken on Bougainville. On racial profiling, hard-won police reforms, and why the Age was so wrong about the riots. IT was mid-2013, and I was about to sit in on a multicultural training session for new Victoria Police recruits. I was writing a feature for The Age about racial profiling. It had taken me several months of asking and some good fortune to get inside the academy, which is located in an old seminary on top of Wheelers Hill. As I waited in the foyer, I peered at the old Catholic church, just beyond reception. They call it an interfaith chapel, but it still bears a large cross and the Latin motto, Christus Altare Nostrum (“Christ Our Altar”). My handler arrived and we walked past the parade grounds, where I saw a recruit stage a mock arrest of a man in a beanie. Back then, the multicultural training comprised just a few hours out of the whole 33-week course. The sessions were scheduled in the first week, while the overwhelmed trainees were barely managing to keep their shirts buttoned in accordance with pseudo-military requirements. So, early on the third morning, the recruits hustled into a classroom, red-faced from a fitness test. The hour-long session was called “Multicultural Communities and Policing” and the facilitator began with facts and figures, followed by a useful discussion of the difference between migrants and refugees. Then, a liaison officer who’d arrived in Australia as a refugee told the recruits a harrowing story of state persecution in his homeland, and warned them that he didn’t trust police when he arrived here. For the brief time remaining, the recruits responded to scenario cards. In the first scenario, an international student was robbed and assaulted on a train, but refused to cooperate with officers. He backed away, arguing that the police never helped people like him anyway. In the second, a driver turned left without indicating. When he was pulled over, the man became very agitated, and accused the officer of targeting him because he was from Afghanistan. What to do? “Don’t engage in that discussion,” the trainer explained. “We’re the Victoria Police. We don’t do that.” The only reason he was pulled over was because he failed to indicate. The trainer did not mention racial stereotyping – conscious or unconscious – or the possibility that an officer would ever stop someone unnecessarily. The trainer, an Anglo-Australian woman, did, however, play the role of the agitated Afghan driver, complete with accent for extra effect. She also warned the recruits that people who speak broken English might be faking it, to avoid fines. Just for a little context. Yesterday in its print edition, the Age ran a headline likening young South Sudanese-Australian men to animals. The headline – “Youths’ behaviour ‘like animals’” – was, in part, a quote from a waiter at Brunetti, who had been supervising the café on Saturday night when the young men came in, scattering the furniture and, reportedly, terrifying all concerned. The Age devoted its front page, plus two double-page spreads and its editorial to the violence in the CBD, which it reported was a fight between “members of the Apex gang, who are predominantly of South Sudanese descent, and members of the Islander 23 gang”. This now appears to be incorrect. Journalists quoted Dr Berhan Ahmed, founder of advocacy group the African Think Tank, who said he had tried to sound warnings about ‘“out of control” young refugees’. Ditto, Salvation Army major Brendan Notte, who said there is “a very deep sense of anger particularly with African youth and also Islander youth”, who “don’t want to be here” and have “often spent time in difficult refugee camps”. Several reporters also chose to link the incident with Victoria Police’s recent efforts to reform racist policing practices. “Saturday’s violence has fuelled debate about Victoria Police’s policy on racial profiling”, they wrote, although, besides the journalists themselves, no one quoted in any of the articles seemed to make the connection. Crime columnist John Sylvester stated that police in Flemington were “bagged for so-called racially profiling black kids”. The newspaper itself editorialised: “Victoria Police have swung too far in the direction of appeasement, especially after the force was sued over racial profiling in the Flemington and North Melbourne areas”. Hannah Fesseha, from IMARA Advocacy, speaks at a community forum on racial profiling. After that multicultural policing session in 2013, the trainer escorted me back to reception. We walked past the parade grounds again – a smallish rectangle of asphalt, like a school yard – and the trainer explained that no one is allowed to step on the parade grounds, because they’re sacred. “What do you mean ‘sacred’?” I asked. I returned to my car, pulse racing, incredulous, and noted down all I could remember, while through my open window I absorbed the shouts of recruits marching like soldiers on the nearby oval. 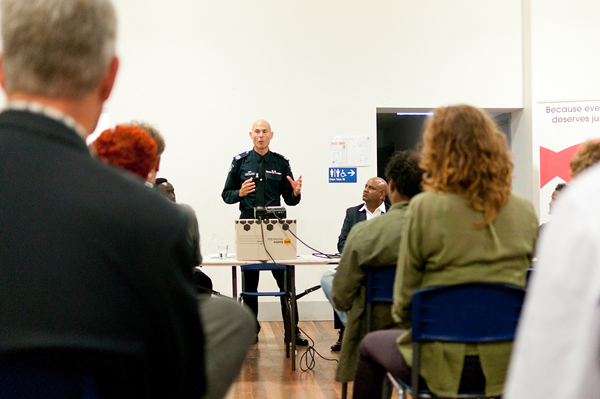 Earlier that year, then Chief Commissioner Ken Lay had announced historic reviews of the force’s cross-cultural training and the way officers deal with people they stop in the street, as part of the settlement of a five-year long racial discrimination lawsuit. It was an extraordinary case, brought by a bold group of teenagers, with the help of the Flemington and Kensington Community Legal Centre, with pro bono representation by Arnold Bloch Liebler and a host of high profile barristers. The young men sued the police, arguing that they were regularly stopped around Flemington and North Melbourne for no legitimate reason, and assaulted and racially taunted. After the settlement, the case files were made public, and I trawled through them. One of the young men, Maki Issa, estimated that police asked for his name and ID at least 100 times in the two years from 2006. One day he was stopped five times, he stated. One officer in particular would greet him by name and then insist on asking for his ID. “I was thinking: ‘Is this guy sick, or is it me who isn’t normal?’” Issa told me. At the time, he was 15. Besides schoolwork, Issa was training hard for a high-level soccer team, and volunteering as a coach for younger kids from the flats. He’d never been charged with any crime. As I left the police academy, I wasn’t optimistic. From what I’d seen up there on Wheelers Hill, the old institution was marooned in the past, both symbolically and practically. But I continued to follow the reforms, sometimes for The Age. Progress has been surprising and encouraging, if incomplete. Lay ordered in-depth, independent inquiries and established a new division to drive the resulting reforms. The force has conducted trials in which citizens are given receipts explaining why they’ve been stopped; overhauled its training for new recruits; and rewritten its handbook on interactions in the street. Last September, Victoria Police became the first force in Australia to explicitly ban racial profiling. Compared with what I witnessed at the old hilltop seminary in 2013, that’s like a defence of the Enlightenment. The force has yet to extend this more sophisticated training beyond new recruits and select high-ranking officers – and that leaves 12,000 or so officers in the dark. And, regrettably, it hasn’t implemented any way of measuring or enforcing its prohibition on racial profiling. Issa and Daniel Haile-Michael, both among those who sued the police, released a report last year stating that discrimination remains an everyday reality on the street. “What’s really going to be a game changer is if there’s an independent body that investigates complaints against the police,” Haile-Michael told me. But on the whole, police high-command are inching towards further change, prodded by the community. Indeed, after the incident on Saturday night, Deputy Commissioner Andrew Crisp is reported to have emailed police members, restating the force’s zero tolerance approach to racial profiling. That’s what makes some parts of yesterday’s coverage by The Age all the more extraordinary. The ban on racial profiling doesn’t prevent the police from investigating any crimes – it just prevents them from stopping people because of their skin colour, rather than reasonable cause. The ban on racial profiling is about justice and fairness, and about good policing. It is built on many years of research and activism both here and overseas. In Melbourne it has been driven by an inspiring group of young people who are demanding their right to participate fully in our society. No journalist or editor can be unaware of the racism inherent in describing black men as animals. Neither can responsible writers be so loose as to connect vague and broad terms such as “African youth” and “refugees” with depictions of chaos and criminality. And given the column-space dedicated to racial profiling over recent years, it is incumbent on The Age to provide a more complex analysis of the reforms Victoria Police has introduced so far, and the good reasons why it has done so. Could a partnership between a small town and a large utility help to transform the Australian electricity grid? FIVE years ago, Geoff Park and his neighbours began investigating whether their village, Newstead, could become Australia’s first 100 per cent renewable-powered town. Motivated by rising electricity costs, Park and the group began by completing energy efficiency audits of 400 out of the town’s 500 households – an extraordinarily high participation rate. But when I first spoke to them, two years ago, the project had stalled. The situation has since changed. In early 2015, the group received a A$200,000 grant from the state government to develop a business case. Then in September, a high-level delegation from Powercor visited. Afterwards, the parties began negotiating a Memorandum of Understanding to govern the project. What happens next in Newstead matters. It is a case study for an emerging global phenomenon: the shift from a centralised, fossil fuel–powered grid to more decentralised, renewable electricity systems. Can the old system work with the new? Can communities protect their worst-off and keep the profits? And will governments help or hinder that change? Central Victoria, the region surrounding Newstead, is becoming a hub for community-owned renewable energy – but nothing has come easily. 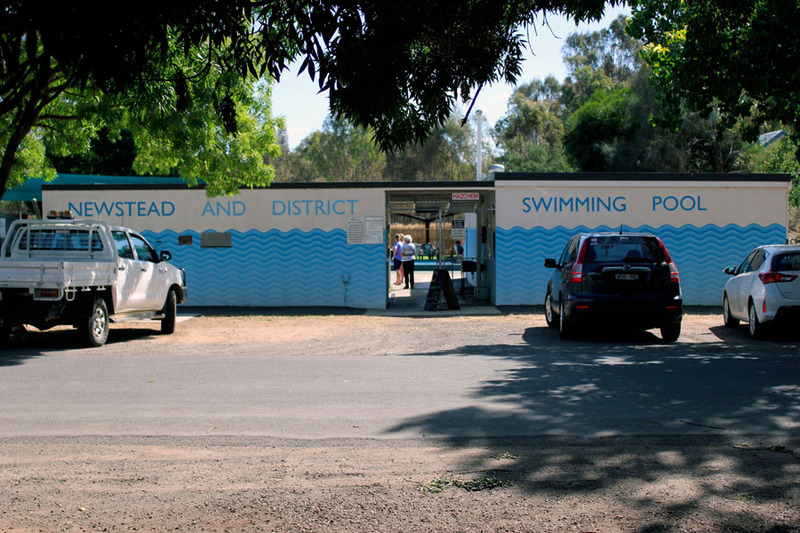 Daylesford and Hepburn are twin towns only a short drive south of Newstead. On a Saturday morning in early November, over 100 people seated themselves at the Daylesford town hall, and waited politely for the annual general meeting of their community wind farm – the Hepburn Wind cooperative – to begin. Outside, the footpaths thrummed with city tourists, there to relax in day-spas and visit the mineral springs. The Hepburn Wind cooperative is Australia’s first and only community-owned wind farm; it took six painstaking years to recruit over 2,000 member-owners, raise capital, gain planning approval and build the two turbines, which they named Gale and Gusto. In 2011 the turbines began generating; they produce more electricity than the households in both towns use. In the last two years, however, the cooperative has been buffeted by federal government policies. The nation’s electricity consumption had peaked in 2008-2009 and then fallen, and that had caused a political problem. Instead of simply supplying extra demand in the network, new clean energy would now have to displace established coal-fired generators. In 2013, Australians elected a conservative government – led by then-Prime Minister Tony Abbott – that was determined that coal would not be displaced. Abbott had previously described climate change as “absolute crap” and campaigned hard against the carbon price by repeating a slogan: “Axe the tax”. In office, he described wind farms as “ugly” and “noisy” and, while opening a new coal mine, declared: “Coal is good for humanity”. His government set about abolishing or undermining the nation’s suite of climate change policies, including the carbon tax and a target for renewable energy. Taryn Lane manoeuvred around the hall, checking the sound, fixing PowerPoint presentations. Formerly an international development worker, Lane has been employed by the cooperative since 2011, and also for its offshoot, Embark, a not-for-profit consultancy promoting community renewables. According to Bloomberg New Energy Finance, new investment in large-scale wind and solar farms in Australia fell by nearly 90 per cent in 2014 compared to 2013, while elsewhere in the world it rose by 16 per cent. But all the while, householders continued to purchase solar panels. Surreptitiously, Australians have been installing rooftop photovoltaic systems at a higher rate than anywhere else in the world, with panels now on one out of every seven houses. And, even more quietly, a parallel movement has developed: community energy. 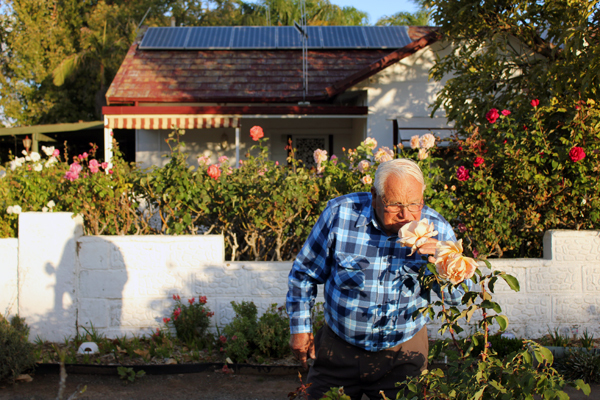 In 2011, Hepburn Wind became the first community-owned electricity generator in Australia. Now, there are 22 completed projects nationwide, mainly solar installations, and 70 more in various stages of development: the townsfolk of end-of-the-line Tyalgum want to cut themselves off from the grid, while professionals in Sydney are putting panels on the city’s convention centre. Another town, Yackandandah, is aiming for “energy sovereignty” by 2022. Calling themselves “Totally Renewable Yackandandah” or TRY for short, residents explain the meaning of community energy by way of “three D’s”: “decarbonising, decentralising and democratising”. In the months before the Hepburn Wind meeting, the outlook for renewable energy improved abruptly. After nearly two years of uncertainty, the Abbott government finally set a reduced target for renewable energy. Even though it was lower than before, the policy was now clear for investors. Then, in September 2015, Abbott was ousted by a more moderate leader, Malcolm Turnbull – who in a previous stint as leader of his party had supported a carbon tax. The market price earned by larger-scale renewable generators, such as Hepburn Wind, increased by 50 per cent in just three months. The state government in Victoria had changed too, and among its early decisions were the reversal of strict planning rules for wind farms and the awarding of two grants for community energy proposals – one of them for Newstead. It also commissioned Lane and others to draft a new Guide to Community-Owned Renewable Energy. The state energy minister, Lily D’Ambrosio, attended the Daylesford meeting to launch the guide. The event was unexpectedly emotional – a collective, tentative, sigh of relief. During her speech, D’Ambrosio removed her reading glasses and looked up from her notes. “It’s dangerous when I go off script,” she said. “But empowerment is so important in all of this. My view is that for ordinary citizens, energy has been something that happens to us. I think people are drawing a line under that. 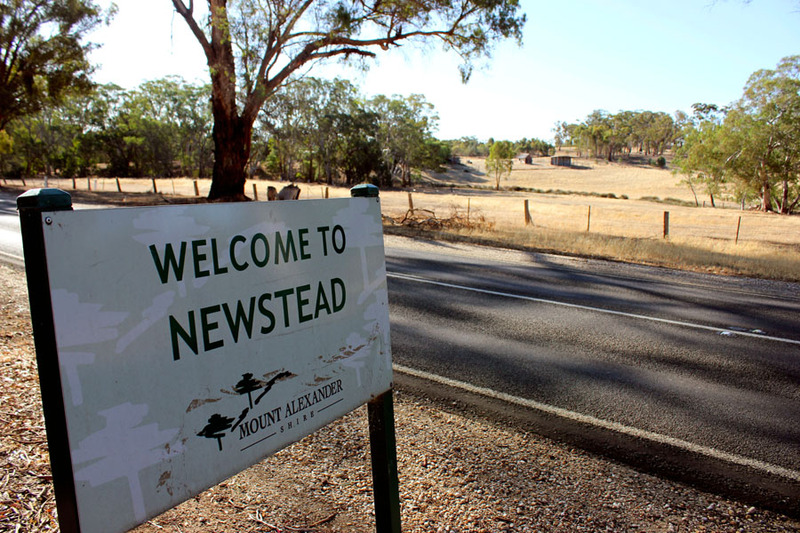 Newstead was founded in the mid-19th century when farmer-settlers took land on the region’s grassy river flats, at the expense of the Dja Dja Wurrung people. It became a farming community, then a home for miners in the gold rush, and then a century later, a haven for artists and musicians. Today, one-fifth of residents have solar panels on their roofs. The rest of the town sources its electricity from brown coal–fired generators about 400 kilometres away, in the Latrobe Valley. It arrives by means of a vast system of poles and wires, greased by layers of bureaucracy and market ideology. Over time, production became more centralised, as larger, cheaper generating stations were built. In Victoria, the Yallourn Power Station was first proposed in 1919; from then on, brown coal generators in the Latrobe Valley powered more and more of the state, and eventually Newstead, in 1958. “That’s been the pattern everywhere in the world,” Mountain said. But the pattern is being disrupted. Over the last decade, the price of solar energy has plummeted, and, because rooftop panels produce electricity where it is used, they bypass the extra costs imposed by distributors and retailers. “The network still has value when the sun isn’t shining,” Mountain said. “But even that value is under threat from the revolution going on in energy storage technology. The underlying economic value of networks has declined massively. Between reports for clients, Mountain has been chipping away at a PhD – “It has no end!” – analysing the way electricity regulation has failed in Australia. The networks are regulated monopolies (some were privatised, others are state government–owned corporations) and they receive a return on the value of their assets. Mountain describes the set-up as a “golden goose”. He has been among the most vocal of the analysts who argue that the regulatory system has permitted enormous over-investment in infrastructure. He argues the value of distribution assets must be written down – a sunk cost of A$60-70 billion – otherwise, network owners will seek only to protect their guaranteed returns. For now, despite the sheer numbers of solar rooftops in Australia, they contribute only 2 per cent of the nation’s electricity generation. Community energy projects comprise only a tiny fraction again. Mountain pointed to another barrier, especially for community energy projects such as Newstead: complexity. It’s a daunting task for volunteers: they must find a large sum of capital to pay for the generation technology; they need expertise in metering and billing; and their systems must allow for customer choice. They have to negotiate backup supply in a wholesale energy market that has very volatile prices. Despite Powercor’s enthusiasm, the negotiations with Newstead dragged on. Park had hoped for an agreement by late October. On a Saturday in late November, he reported back to a small group of volunteers gathered in the Newstead community garden – a project they had conceived and built, doggedly, during Australia’s long drought last decade. The draft agreement outlined the information to be shared: data on local consumption and network costs, tariff forecasts, and an analysis of possible business models. He estimated it was still a fortnight from completion. It had seemed a fortnight away for the last two months. In his spare time, Park –a landscape ecologist – is a prolific bird photographer. On his blog, Natural Newstead, he only posts images from within 15 kilometres of the town; the blog is one of the top 100 bird watching websites in the world. “I’m motivated by climate change and responding to that, but this is not about saving the world,” Park said. “Our main interest is not so much in renewable energy; it’s in community building. In the case of Renewable Newstead, their motivations are to keep people on the grid, and keep it cheap. The town has comparatively low average income, and scores highly on measures of socio-economic disadvantage. Many residents already struggle to pay their bills. Park and the others want to save their grid: to find a new economic model that keeps it affordable for everyone. Newstead’s main advisor, Tosh Szatow, runs a consultancy called Energy for the People and a crowdfunding platform called The People’s Solar. He’s also advising Tyalgum, the hamlet planning to go off-grid altogether. In a video promoting that project, he wears a blue t-shirt that says: “Stick it where the sun shines”. In the Australian media, he is often asked to talk about the so-called “death spiral” for networks: the scenario in which householders install solar and batteries, and leave the grid, which drives up network prices, which causes more people to leave the grid – and so on. In Newstead, however, he believes there is a way for the old and new technology to combine. His advice is to establish a micro-grid, still owned by Powercor but managed by the community – it’s the kind of model used by shopping centres, apartment buildings and caravan parks, but it has never been used for an entire town. Under those circumstances, residents could run a local generator-retailer, which returns profits to the community. “We’re talking about a model where the assets aren’t written down. People stay connected to the network,” Szatow said. Finally, in early January 2016, an entourage from Powercor drove to Newstead. Alastair McKeown, the chief finance officer, arrived in a silver Porsche to sign the agreement on the company’s behalf. Geoff Park had pushed together two tables in the town’s only café. He expressed his gratitude for the unlikely partnership between the corporation and the small community, two entities “poles apart”. A surprising and satisfying conversation ensued, as the out-of-town professionals and local volunteers traded speculation and frank questions about the future of energy, for more than an hour. “We know there’s change coming,” McKeown said. Park summarised the long history of the project so far: five years, only to reach the beginning. Now, many will be watching, from near and far. TEN years ago, Daniel Haile-Michael and his teenage friends felt nervous walking the streets of Flemington: they were scared of being harassed by the police. And then they sued them, for racial discrimination. Now, in a groundbreaking reform Victoria Police has become the first police force in Australia to officially define and prohibit racial profiling by its officers. Through changes to its “police manual”, which came into effect at the start of September, the force has formalised a “zero tolerance” policy on racial profiling. The measures are the latest in a series of reforms compelled the legal action taken by the teenagers. The young men claimed they were regularly stopped by officers for no legitimate reason, and assaulted and racially taunted. Their case began in 2008 and was finally settled in the Federal Court in 2013. It states that such profiling is “a form of discrimination” and is illegal. It requires officers to consider under what law or authorisation they are acting when they stop someone. Ms Tamar Hopkins, from the Flemington and Kensington Community Legal Centre, which represented the young men during their case, described the new manual as “a huge improvement on Victoria Police’s previous position”. Victoria Police Commander Sue Clifford said the changes “underpin all the decisions we make as police”. “The new policies send a very powerful message to all our officers, employees and the community that human rights are at the centre of everything we do,” she said. Nevertheless, Commander Clifford said the force has made significant improvements to its culture and training in the last two years. She doesn’t believe it has a problem with racialised policing. “Victoria Police has completed significant work to ensure we do not racially profile in any form,” she said. 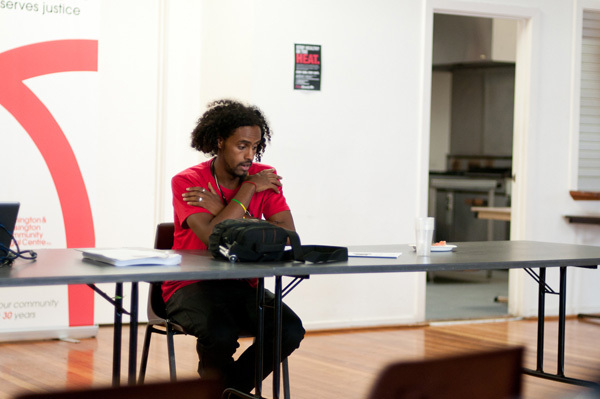 Daniel Haile-Michael has now completed an engineering degree, and works at Kids Off the Kerb, a youth space in Footscray. He welcomed the policy change this week, but said racial profiling remains a problem on the streets. While the situation has improved in Flemington, he said, North Melbourne has become “a new hotspot”. “What’s really going to be a game changer is if there’s an independent body that investigates complaints that are made against the police,” he said. Earlier this year, Mr Haile-Michael co-authored a report, The more things change, the more they stay the same, on the progress of police reforms since the settlement of his case. Ms Hopkins, from the Flemington and Kensington Community Legal Centre, is concerned about how the ban on racial profiling will be put into practice. The legal centre regularly lodges complaints on behalf of clients relating to assaults or racial profiling by police, but none has been substantiated, she said. 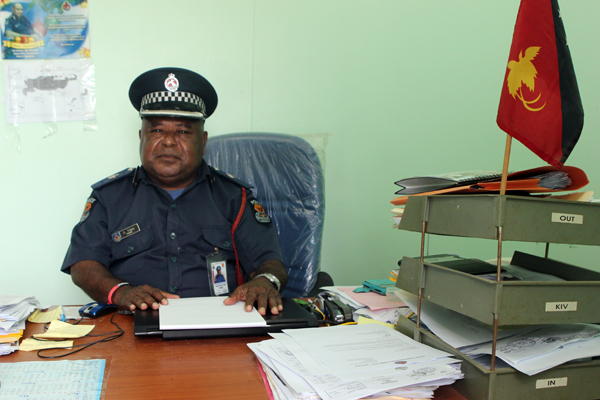 Acting Commander Mick Hermans is responsible for taking head-office policies to the beat. He oversees part of the North West Metro division, including Flemington. Six months ago, he undertook “anti-bias” training, aimed at undercutting stereotypes. The force has not provided anti-bias training for the rank and file, but Commander Clifford said it is “scoping an online learning package” that would “reinforce the principles in the new policies”. This year in Mooney Valley, Acting Commander Hermans implemented another of the reforms promised to Mr Haile-Michael – a trial in which citizens are given receipts explaining why they’ve been stopped. Victoria Police encourages anyone who has been given a receipt to complete an online survey about the experience. Likewise, community legal centres have established the Stop Watch Vic website, to gather independent feedback on the receipting trial. They have criticised the trial for failing to require officers to collect data on the perceived racial background of the people being stopped. This article was first published by The Saturday Age. Read it there. If the Lord won’t send us water, oh, we’ll get it from the devil. “YOU’RE under five metres of water right now,” Barry Philp says. “Hard to imagine, isn’t it?” I look through the windshield of his four-wheel-drive. The sky is blue and empty and the land is dead flat to the horizon. We’re rattling along a grey clay track on the bottom of Lake Menindee, several kilometres from its shore. Three years ago the lake was full. Together with surrounding lakes, it held five times the water in Sydney Harbour. 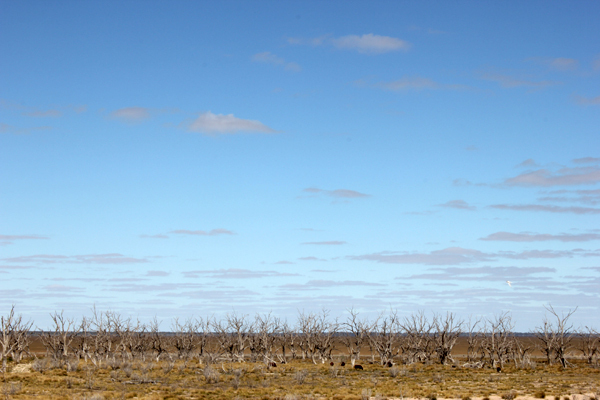 Beginning in 2010, two summers of severe rains had followed a prolonged, notorious drought in eastern Australia – “the millennium drought”. The land was flooded. But yet again, so soon, the inland is wretched for lack of water. Rainfall in the past three years is tracking lower than the worst on record. Today, the lakebed is bone dry. In this improbable place, we are driving in search of water. It is late April 2015. Four months ago, officials estimated that Broken Hill, population 18,000, would run out of water in August. They began a drilling program to find emergency supplies from underground. A blue rig rises above the plain, surrounded by white trucks and men clad in orange and blue. Philp pulls up next to it. He grew up in Menindee, the hamlet nearby, and now manages the enormous Menindee Lakes storage infrastructure with his small team of seven. The system was built in the 1950s to secure a water supply for Broken Hill, 70 miles north-west. For the second time this century, it’s on the brink of failure. We watch as water gushes from the bore, muddy at first, then clearer. Nick, a geo-hydrologist from Canada, takes samples. To complete the test, they’ll pump water from the well – about 55 yards underground – non-stop for two days, while assessing the results from three surrounding monitoring wells. What is the flow rate and quality? Is the water table dipping? Is water migrating through the aquifer? 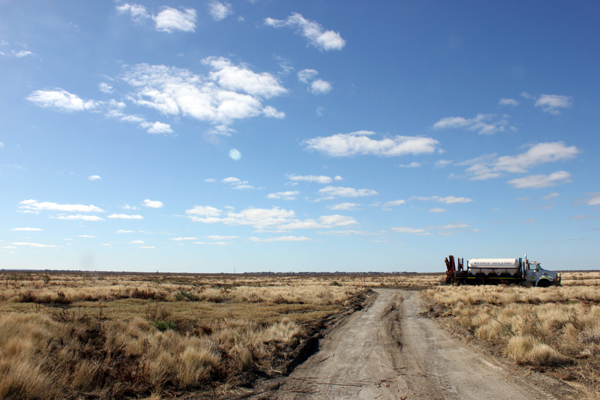 But while the drillers are working seven days a week, the residents of Broken Hill are agitating just as hard for them to stop. 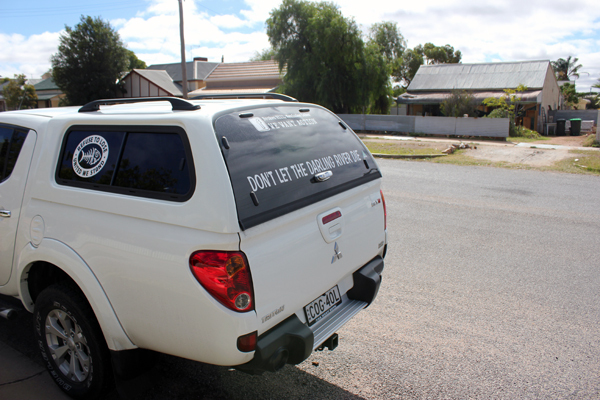 A campaigning group called WE WANT ACTION has sprung up – its logo is a fish skeleton encased with the slogans: “Refuse to Lose” and “United We Stand”. 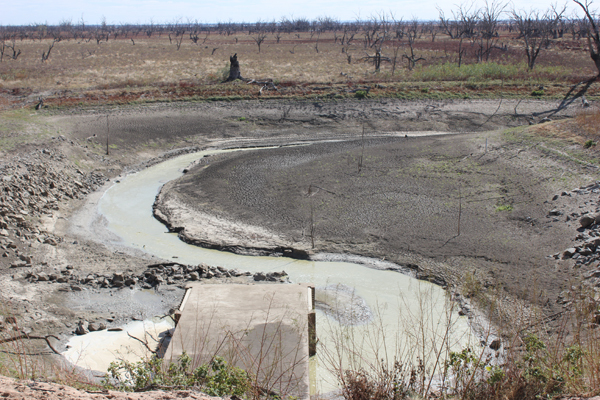 Mark Hutton, a long-ago retrenched miner, who now works on the hospital’s reception desk, founded its predecessor, the Darling River Action Group, during the millennium drought. He’s among the leaders of its vigorous online incarnation, which uses Facebook to publicise and scrutinise water supply issues and foment opposition to the bores. In these parts, resistance is a way of life. “We’ve been fighting the New South Wales government for 200 years,” he says. 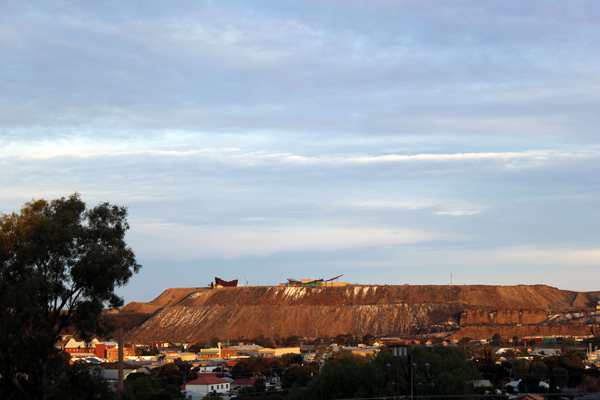 Chemists define it as H2O, but in Broken Hill, water demands a more complex formula. Add salt and scarcity, erosion and evaporation, ill-considered dams and irrational irrigation, intractable politics, sacred sites, speedboats and roses. Stir up dissatisfaction and stand well back, because, within days, the state government will announce its emergency water strategy for the town. Locals protest against water policy decisions by way of the “WE WANT ACTION” page on Facebook. What’s left of Lake Pamamaroo. 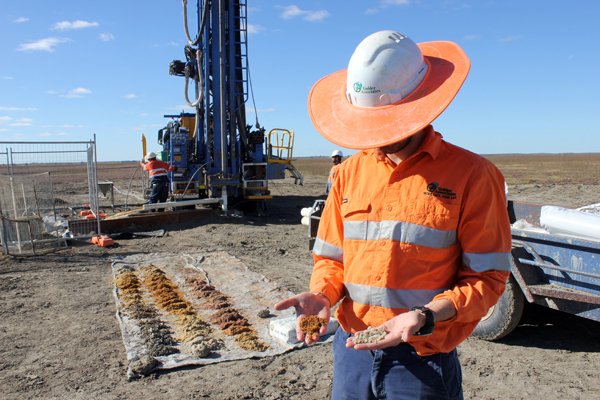 The bore drilling team is working on the enormous dry bed of Lake Menindee. A geo-hydrologist inspects earth samples from the test bore on Lake Menindee, while water begins to be pumped from the well.